This week my One Room Challenge could be summed up entirely by Alice In Wonderland…. I’m late, I’m late, for a very important date. No time to say hello, goodbye, I’m late, I’m late, I’m late! Today is Hannah’s prom, and in a months’ time the little peanut I was feeding mashed banana too from an Elmo (“Melmo!”) spoon will be a high school graduate and moving seven states away come August!!! Words can’t even describe how excited I am for her, and as I learned when Peter went off to college this year, that joy at seeing your child go off to this amazing experience ahead of them overrides the how-did-the-years-go-by-so-fast lump in your throat. BUT MAN OH MAN. Motherhood is not for sissies!!! 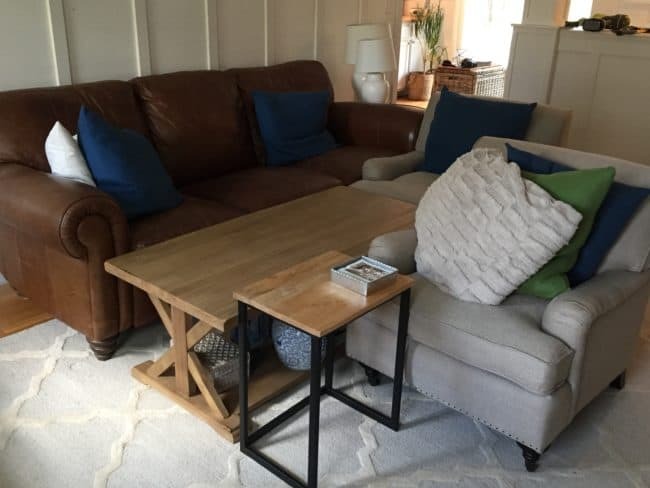 Things are moving along in the family room, despite appearances…..
Our living room is also a mess with all sorts of possibilities for this family room makeover stacked in the corner! This week my focus was on the finish carpentry and caulking. 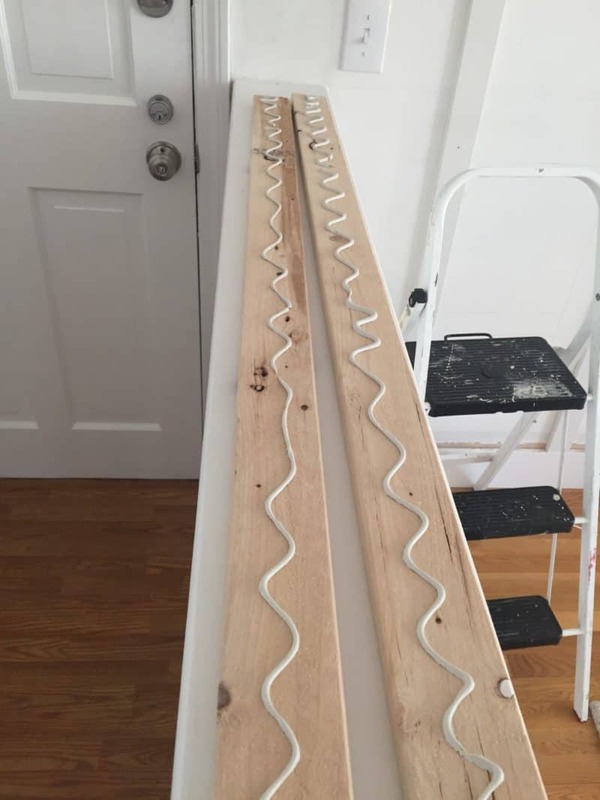 While the rough carpentry like installing the battens on the walls goes quickly (they were all cut and installed within a couple of hours), some finish carpentry is tedious work and I want to do it right. 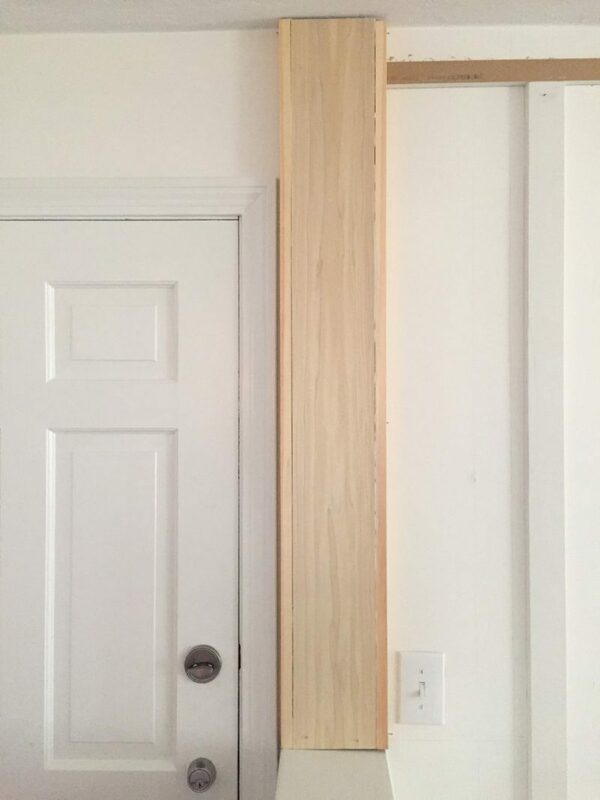 ….and then I built a shallow pilaster (which is just a pillar that is attached to the wall). then attached a poplar board, with 1″x2″s on the sides to create a box. I covered up the seams with the same trim I used on the pillar and the fire place surround. Adding the pilaster means that instead of being able to install one piece of crown all the way across this doorway, I’ll be cutting a bunch of intricate little pieces to wrap around the pilaster, like I did at the top of the fireplace…..
I’m having trouble uploading photos today for some reason, but just imagine me knee deep in crown moulding scraps as I try to master that skill, it’s so insanely frustrating but ultimately gratifying. I’ve said it a million times before, but crown moulding, I hate myself for loving you! A few hits and misses this week…. 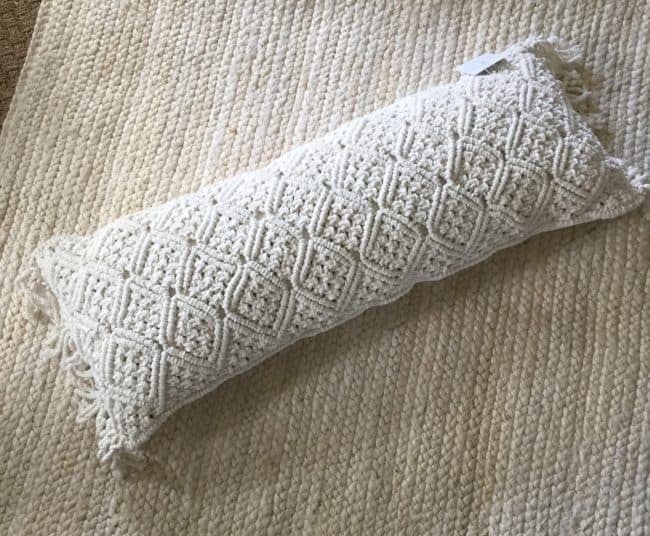 HITS: a macrame lumbar pillow for the couch (a Homegoods find that Mark will remove every single night 🙂 ) and the ivory jute braided rug that a few of you guessed was the one! I know some of you will think I’m nuts after I showed you the close up of our current rug in here, but this rug is hard wearing, reversible, and soft enough to sit or lie on the floor. Instead of just using a rubber non slip rug pad I upgraded to a felt/rubber pad to give it a little more cushiness. This is the specific rug pad I bought; there are a few other rug pad options in my Shine Your Light Amazon Shop if you’re looking for one. MISS: A few days after I ordered a custom print on canvas by artist Carol Schiff, I realized I had made a grave error in the size and that it was going to be way too small with the low back of the chesterfield sofa. It arrived this week and indeed it looks miniscule on that wall, but I LOVE it and am so excited to hang it in another room! I wanted an abstract piece and gave Mark a bunch of choices (see, I’m a team player!). This is as abstract as Mark goes. It’s seriously so pretty in real life! While I don’t have buyer’s remorse at all because this piece is so beautiful, I DO need to figure out a plan B, and a low-cost one at that, considering I just blew my budget for art! Let’s just add more projects to this crazy six weeks, that’s a good idea!! MISS: The sconces!!!! The white ones are smaller than I anticipated, even though I measured and drew the approximate size on the wall. 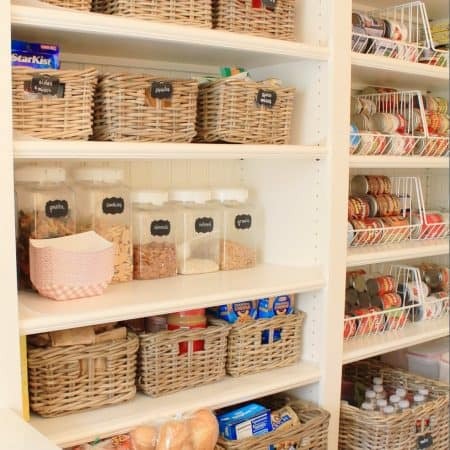 I know you are all huge fans of the starburst, me too!, but I temporarily hung them on a nail and lived with them for a few days, and I don’t know if they jive with the rest of our house, fixtures, and ultimate plans for the kitchen which is open to this room! You see how I make a one room challenge even more challenging? Thank you. It’s my special gift. The furniture will be delivered next week, I can’t wait!! 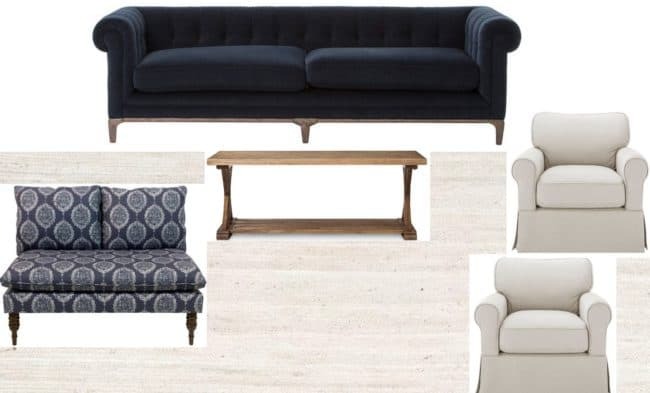 To refresh your memory, these are the primary pieces of furniture plus the rug. I’ve got to come up with a good art project and FAST!! Best wishes to my ORC comrades, can’t wait to see how your rooms are progressing! 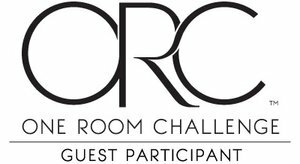 Check out all the One Room Challenges here and have a wonderful weekend ahead! ONLY TWO WEEKS LEFT!! AND SO MUCH TO DO!! Lisa, you are so incredibly talented! Those pillars and the half wall look amazing! Way to go, my friend! That is such a compliment coming from you!! Why can’t you live next door to me so we can not do laundry and think up new ways to rip apart our houses and build things? 🙂 Thanks for your sweet words. I appreciate you! I agree…motherhood is not for sissies! And neither is the One Room Challenge! Your room is really coming along. I am always so impressed with your woodworking skills. 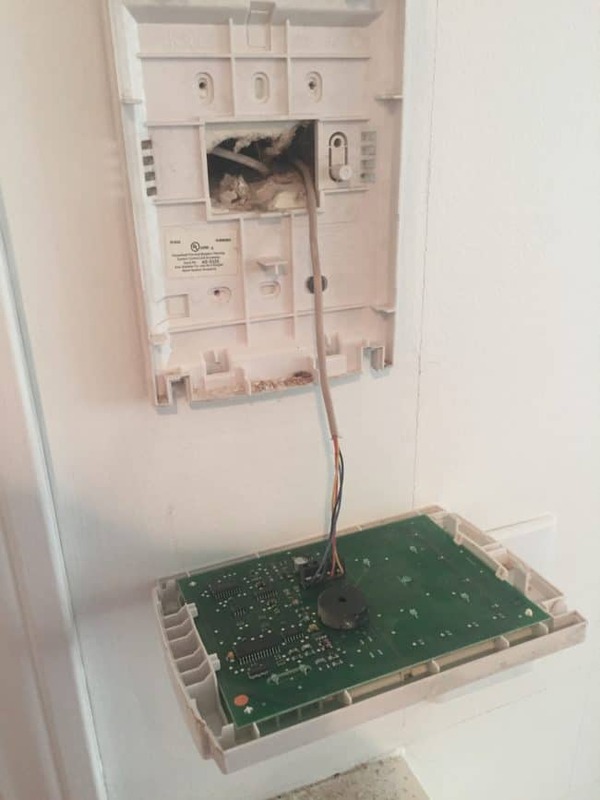 We have to hire someone to do even the littlest thing in that area… Too bad about the artwork but it is pretty and I am sure you will find a place for it. Good luck over the next 2 weeks! And cheers to the weekend! I did already hang that piece of art so all’s well that ends well, it found a good home. Now hopefully I can find something else for the family room lickety split! Good luck to you too and happy weekend! Finish carpentry work is so tedious, so kudos to you for taking this all on! I’m leaning towards hiring it out in the future. 🙂 Congrats to Hannah (and parents) on her college acceptance and commitment! I’m fretting the fact that my oldest will be in 8th grade next year… can’t imagine sending him off to college. :/ Waah!! 8th grade, that’s big time!! It is crazy how the time goes by when you have kids isn’t it? And yes a sane person would hire someone to do all the things that frustrate and make them crazy, but I so love woodworking, and want to learn how to do it all!! Everywhere I go I study mouldings and try to figure out how I could do it myself, it’s a sickness! I’m always so impressed by people who take on doing moulding themselves – something I haven’t yet attempted due to intimidation. I’ll be interested to see what you come up with for your art as I’m finding myself in the same boat – there is no more budget and I have a big blank wall to fill up! Oh it’s so gratifying Michelle! 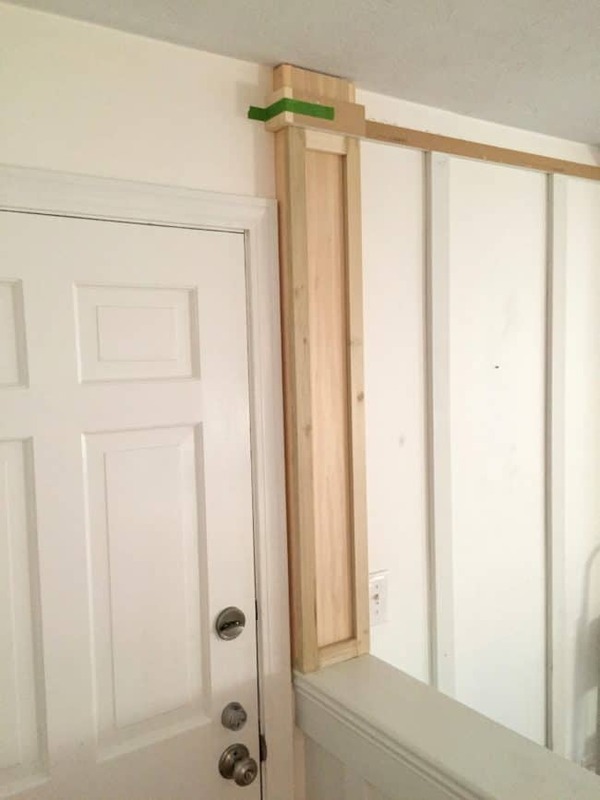 My husband taught me a few things one time, and then he went on a business trip, and when he came back I had installed board and batten in our foyer and up the stairs. That was the beginning of my complete infatuation with woodworking and wanting to learn how to do it all! Good luck with your art project – maybe you’ll score something amazing at Goodwill or shop your house and find something that would be the perfect fit for your big wall! Thank you for your support my friend! I appreciate your positivity through these crazy challenges we take on! And yes, my girly will be fine and so will I……it’s a bittersweet time for sure! Your woodwork is amazing Lisa! It adds so much to the room. Glad you were able to get your chairs taken care of. I know you’ll figure out something cool for the art! Thanks Dara! I hope some fantastic idea hits me soon because our days are numbered with this thing! Good luck this week, can’t wait to see more of your room! Those stairs though, wow! Oh LISA! It’s all coming together! I love this space! Lisa those moulding details are amazing!!! And I love your choices for the space (especially that couch!!) Kudos as well on defining your misses – I’d detail mine on my blog but there are too many to count!!! LOL! you never cease to amaze me Lisa! Wow! 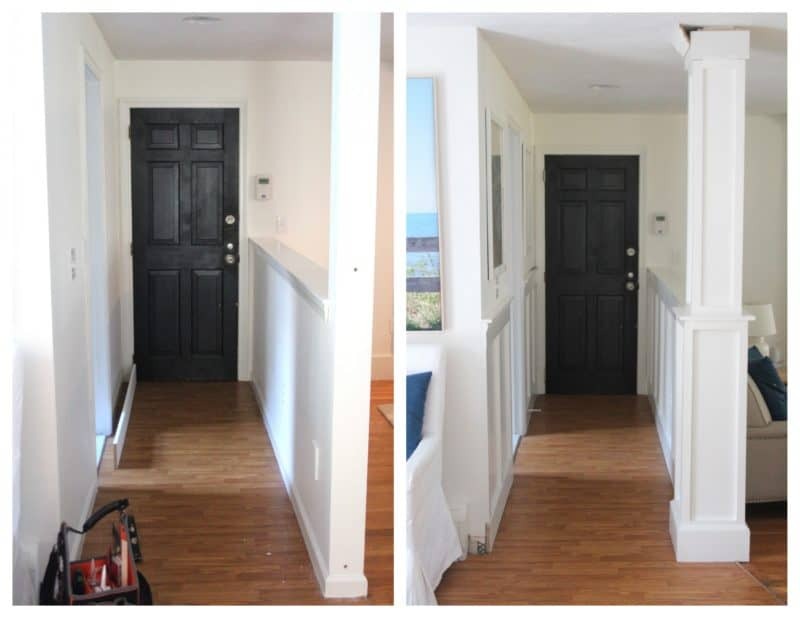 that molding makes such a difference in that hallway… it looks amazing. Almost there!! I think you’re doing great! You’ve got a lot going on with your kids right now and still motoring along with the challenge. I just love how you’re doing the carpentry! I’m sooo impressed!! 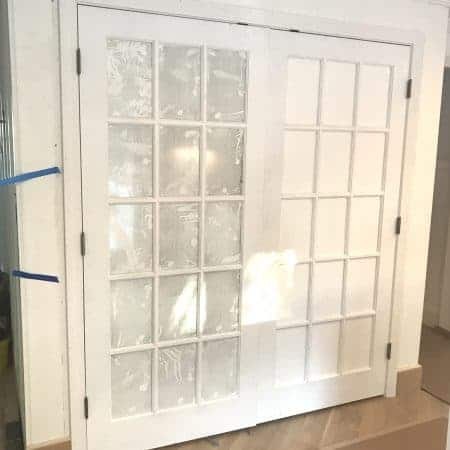 The carpentry is actually my favorite part Brenda! Even though it makes me crazy and I routinely say to my husband, why do I love this again? But when it’s all done……so grafitying! Thanks so much for your kind words, I appreciate them so very much!! You are a moulding wiz!! It seriously all looks amazing? So is excited for the reveal! My kids are at the age where they’re starting to hang out with friends more than us, and it’s rough. I can’t even imagine how sad I will be when they leave. Your trim detail is gorgeous!! As is the art! Can’t wait to see your room! Thanks so much Emy! We’re almost there!! I saw recently a woman purchased a fabric shower curtain and stapled it to an over sized canvas frame-voila, as they say! Instant art-large and reasonably priced! Oh my word – you have had a lot to deal with this week! The ORC is challenging enough without throwing in the emotional heartstrings of real life! College! Prom! and all that they involve. Sorry that you have had some “misses” with your project this week – we understand these disappointments all too well! 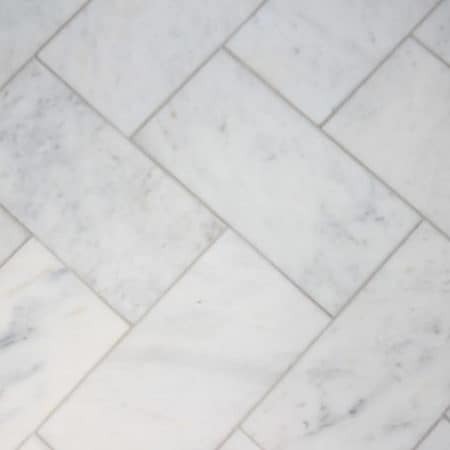 Your space is looking great! 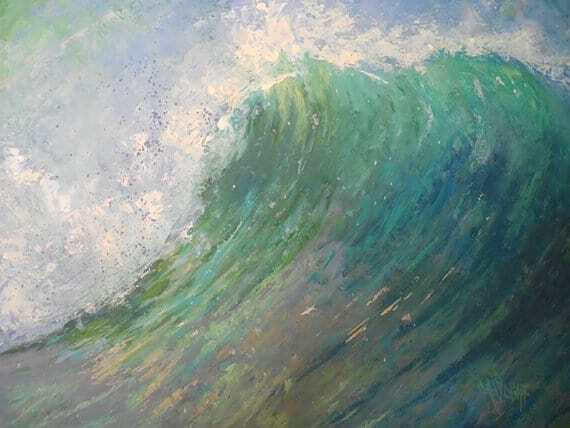 I have often seen small pieces of art at my mom’s art gallery matted and framed to become much larger – perhaps a possibility with your too small piece? If not, start combing greatbigcanvas.com where among the dross are some very nice prints. IIRC my 30×24 cost $50 and I put it in a $10 thrift store frame. It’s rad. You can do it! 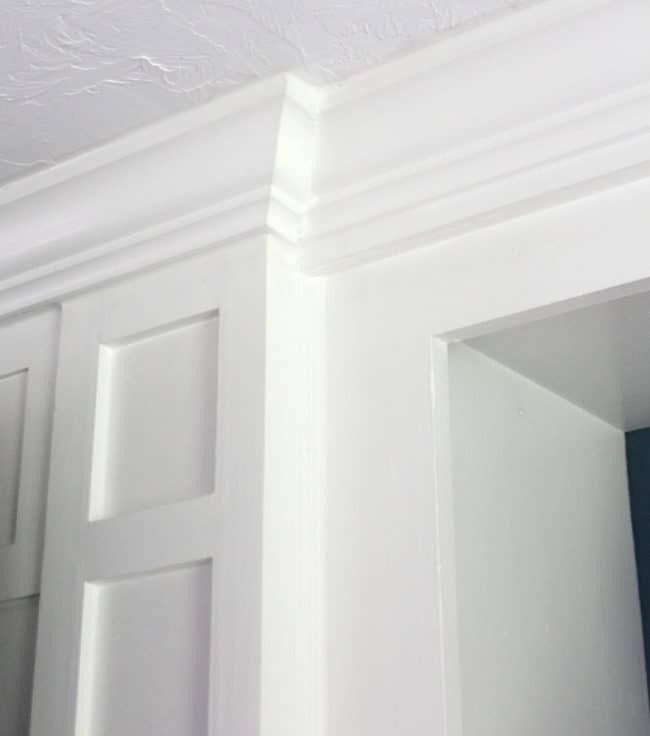 That post and all of the trim detail looks absolutely amazing, you are so good at that! I’m with you on the art, I still have no idea what I’m doing for a big gallery wall over Em’s desk. Here’s to a busy week! I just love your sense of humor and heart… I wish we were next door neighbors! I totally understand where you are coming from with the second babe heading to college soon. I was okay (sorta) when the first one took off but I admit it – I was lost for a little bit after the second one took off. Thankful to have one still at home, at least for a little while. I can not wait to see the final reveal of your space, it is going to be amazing!! Lisa your woodworking skills are amazing! I love your choices for the room. Those armchairs look super comfy. I feel ya! I feel like I just spun my wheels all week and got no where. Pushing forward to the finish line!!! I love how it’s all coming together! Your new pillow is gorgeous, and I’m sure the art will be a hit in another room! The beefed up pillar looks sooo good! 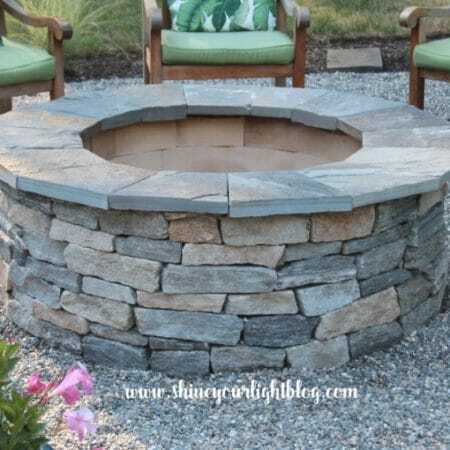 And can’t wait to see that furniture in your space- looking forward to the next post! Thank you my friend! The pillar and moulding makes such a difference to our house! Lisa- I’m loving all the character you’re adding to your home in this process. GREAT JOB! Thanks so much Monica! I’m so glad the ORC motivated this makeover – it has made such a difference to our home! I love all the choices you’ve made so far, Lisa – can’t wait to see this room finished and fluffed!!! Thanks Debbie, I appreciate all your encouragement! You’re the sweetest!